For corporate users, or anyone without a Gmail account, really, Android's stock e-mail client can leave something to be desired. If you're looking for an e-mail app that can offer multiple Exchange accounts and sync IMAP/POP3 accounts simultaneously, I suggest Enhanced Email. Enhanced Email is an email client based 100 percent off of the source code from Gingerbread. What that means is you'll be getting all of the goodies from the stock e-mail client plus all of the extra bits and pieces the developer has thrown in. Let's take an in-depth look at these features after the jump. The interface looks and feels just like you'd expect it to. Being based off of AOSP code, everything from the Combined Inbox to your individual accounts is familiar, and that's not a bad thing. Once you've set up your first account, you're able to see where Enhanced Email really excels: the settings menus. Dive into the Account Settings, for example, and you'll see some of the same options: Account name, Your name, etc. Choosing Account color, however, yields you a more specific and easier to use color selection panel. 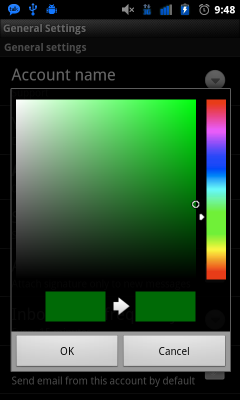 A definite step up from the stock Android color wheel and one of those little things that help set Enhanced Email apart. The Message Settings menu is also a welcome change, offering options for Mobile View, plain text for both inbound and outbound mail, and the option for Auto-BCC, just in case. 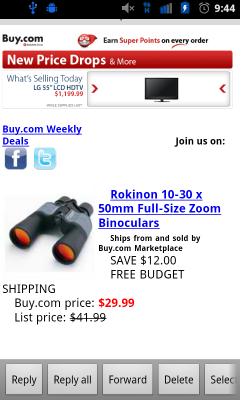 The Mobile View both looks and works like a charm, keeping everything nice and scaled to your screen. There's also Debug Settings and Global Settings, but the Global Settings are nothing new. 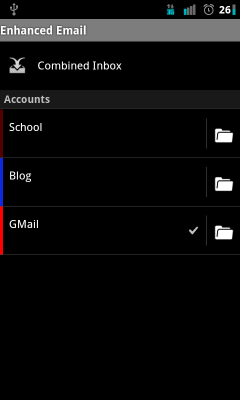 Enhanced Email also includes two widgets (one labeled, one unlabeled), and two themes (light and dark). Enhanced Email is essentially just an app about options. The developer gives you more opportunities to customize how your emails are handled, but it's definitely not going to be for everyone. If you're the type who only needs one email account handled, you're probably fine to keep using the stock client. However, if you absolutely need an assortment of Exchange accounts and IMAC/POP3 accounts being checked at once, Enhanced Email is definitely the way to go. At $9.99, the price may seem steep, but if you're hurting for these features, it's a small price to pay. The developer also boasts an active community where users can request features and troubleshooting help. Overall, Enhanced Email is a good alternative email client. It does what it advertises, but for many, the differences between it and the stock email client might not be enough to justify the price. Fortunately, the developer does offer a 24-hour trial that can be found on his forum.